Scottish stunt cyclist Danny MacAskill has posted a daring video of him and friend Nash Masson riding through the deep snow in the wooded Cairngorms. “Myself and Nash Masson putting our back country skills to the test in the Cairngorms… ‪#‎Gopro ‪#‎Santacruz ‪#‎Snow,” he wrote on Facebook. Skye is soon to be the limit again for Danny. He is to show off his daredevil skills on his home island where he made an iconic jaw-dropping video that has been watched more than 40 million times. Danny is to appear both days at the Skye Live Festival, which runs between April 29-30, and includes more than 20 music acts, including Treacherous Orchestra, Jackmaster, King Creosote and Capercaillie. The cyclist from Dunvegan on the island said he was “really excited” that he and his Drop and Roll team will be performing at the event. Danny even celebrated his 30th birthday last month with a cake that replicated his most famous ride along the Cuillin Ridge on Skye. In 2014 Danny returned home to Skye for his sensational death-defying ride on the isle’s famous mountain range. The original YouTube video of The Ridge has now passed more than 40 million views. The cyclist’s parents feared that he might kill himself with the 7.5 mile ride over the range. But the fearless rider even took time out to pull stunts on top of infamous Inaccessible Pinnacle at the summit of Sgurr Dearg. The Cuillin Ridgeline is known as the greatest mountaineering challenge in the British Isles. Danny first shot to fame when a display of bike handling skills in Edinburgh went viral online. Danny’s trickery on his bike has taken him around the world, producing a series of amazing video clips. 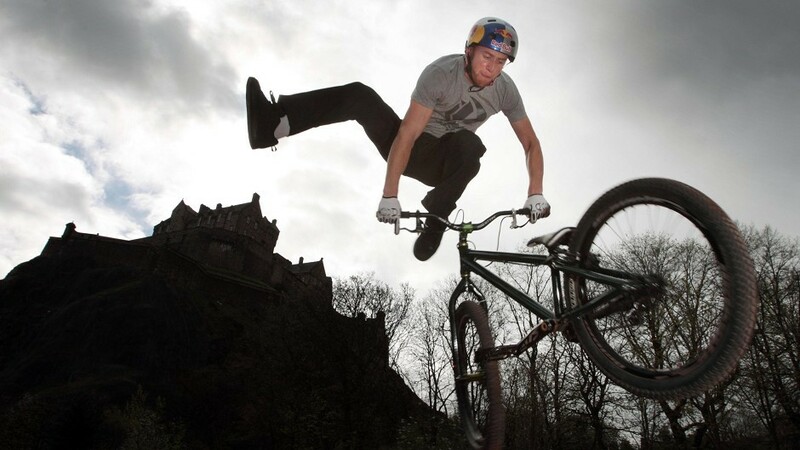 He also used his abilities to promote the Commonwealth Games in Glasgow with a series of bike tricks filmed at the city’s landmarks.